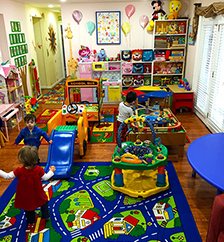 Here at Tiny Angels Daycare we know that the most critical period of life is from birth until around the age of six. This is when the most important characteristics of their life, such as intelligence, physical and cognitive development, and the emotional experiences that will stay with them throughout their life is developed. So we make sure that they feel they are in a loving, safe environment and we keep them engaged physically and mentally with age appropriate education, games, exercise and play. We have been in existence since 2004. We are in the Potomac, Maryland area. We are open Monday through Friday, 7:30 AM until 5:30 PM. Full time, part time and drop-ins are available. We build positive character traits for your child’s development. We emphasize head, hands and heart character traits that a lot of schools are structuring in their program; such as: Caring, sharing, honesty, responsibility, respect as well as good manners. We have a myriad of educational tools and games to keep your children engaged and active in whatever program they fall under. However, we also understand that all children's needs are not one size fits all. We gear our program's to fit the needs of each child individually. 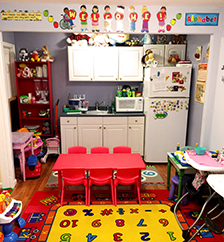 At Tiny Angels Daycare we have many tools, games and activities to educate toddlers, two's and pre-K children to be as prepared as they can be before going into Kindergarden. 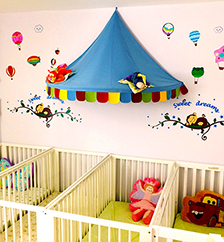 Our experienced caregivers will give your babies lots of affection and stimulation. They will be given one specific caregiver so that a bond of trust will be formed between the baby and the caregiver. We have a full kitchen and a very healthy menu which includes breakfast, lunch and snacks, and we cater to a variety of dietary needs. We believe a healthy diet is key to any child's development.